What powerful features will Android Ice Cream Sandwich tablets have for us in 2012? How much more clever will iOS get? The sky seems to be the limit in both cases. Unfortunately, we can’t say the same for Microsoft. Yesterday it emerged that Microsoft’s Windows 8 tablets, running on ARM chips (less power consuming than Intel’s offerings), are finally due in mid-2013. It’s exciting news for Windows fans, and probably something that enterprise IT professionals will make a mental note to be pre-prepared for. But it might all be in vain. 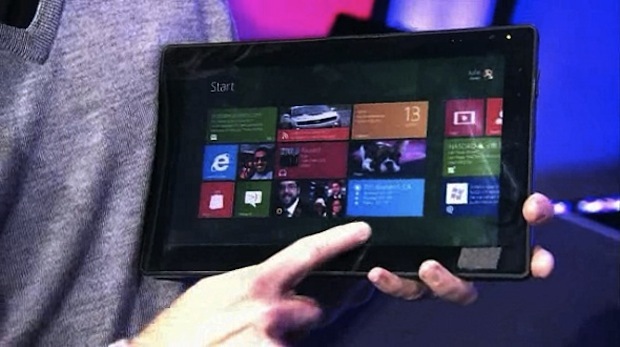 Microsoft’s Windows 8 tablets may already be too late, out-innovated by faster-moving rivals. Forrester research says it’s “bullish on Windows 8 as a product for consumers,” but despite its enthusiasm for the product it’s just put out a damning piece of research that suggests Microsoft’s entire strategy for Windows on the “post-PC” tablet paradigm may be flawed for one main reason: It’s way too “late to the party.” In fact, Forrester calls it the “fifth-mover” in the market–Apple in the lead, Android tablets, HP’s webOS effort, and BlackBerry’s tablet. Though HP’s and RIM’s products have been cancelled and done badly, respectively, they still followed closer on the iPad’s tail than Microsoft has managed. It gets worse, Forrester argues, because companies like Apple and Samsung have already consolidated their designs into second-generation devices…and Apple already has a third generation machine close to launch, forming a strong impression in consumer’s minds. And then more recently the Kindle Fire and Barnes and Noble Nook tablet have burst onto the scene, radically overhauling the lower end of the new tablet market and getting a different slice of the public interested in their devices–for a much lower price, and tighter capability limits. The issue is that the public’s attitudes are changing–in the first quarter of 2011 46% of U.S. consumers (ahead of all others) wanted a Windows tablet, even though none was on the roadmap, but by Q3 this had slipped to just 25%. We can predict that figure will slide even more over the next several quarters, if that trend continues, because products from Samsung, Apple, Amazon and many others will arrive and impress–and in the case of Amazon and Barnes and Noble they’ll entice millions of consumers to buy lots of content from the host suppliers, hooking them into the ecosystems for the longer term. But we also know that in early 2012 there’s a new iPad coming–and from recent rumors and leaks we suspect it’s an overhauled device with a much higher resolution that’ll surpass the screen tech of every other competing tablet. There’re even a few rumors that a smaller iPad will accompany it–refreshing earlier thinking on the matter. We also know that Apple has big plans to radically expand the powers of Siri, its headline-grabbing voice recognition and personal assistant system, and will likely be available on the iPad 3 attracting more consumers with its sci-fi-like powers. At Fast Company we’ve even made a guess about how much Siri will advance, and how more astonishing it may be by 2013. But Siri is driving a new shift toward novel interface technology on smartphones and tablets, and today a new app is hitting the Android platform that in some ways beats Siri’s organizational powers hands-down. It’s called Cluzee and it can even read through your daily schedule for you to remind you of the tasks ahead. It’s not perfect, but what it is is a sign that other apps like it will follow–saying nothing about Google’s own efforts to recapture this high ground. Then there’s all the Ice Cream Sandwich tablets that’ll hit early in 2012. They’ll provide much more power than current-gen Android tablets do–exemplified by a bunch of fresh arrivals from the likes of Lenovo that could outperform on-sale tablets–and because Ice Cream Sandwich is being hailed as the best effort Google’s made yet at addressing the UI controls of a tablet, they’ll likely fix some of the remaining flaws that differentiate Android tablets from the seamless iPad. Then there’s likely at least another couple of generations of Android tablet OS to come, complete with UI refinements and wholly new technologies like NFC commands, indoor navigation, and voice recognition long before Windows 8 arrives on ARM-powered tablets. What this means is very simple. Over the course of the next year iOS and Android tablets will shape the consumer market, and, increasingly the enterprise market too (RIM’s failing PlayBook device is testament to this). The public will become more and more used to a slicker UI than Microsoft can deliver with Windows 8–which is promised to be close to Windows 7, and also (in the case of non-ARM tablets) to allow the familiar Office apps, along with other Windows staples, to run in a traditional Windows layer beneath the touch-friendly main UI. Dare we suggest that recent rumors MS is working on an iPad-friendly version of Office is as much an admission of defeat as it is a smart move to cover all bases? Microsoft needs to enter the market sooner, and possibly cheaper, with a radical and paradigm-twisting product that offers powerful innovative systems that consumers will be delighted by, perhaps something along the lines of its cancelled Courier product. Otherwise it risks failing before it even hits the market.